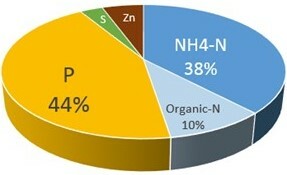 Targeting fields requiring supplemental phosphorus (P) produces the largest economic value from manure. Targeting fields requiring supplemental potassium (K) significantly increase manure’s value. Additional value result from manure nitrogen (N) and micro-nutrients as well as from yield increases. However, these benefits are typically less important than P and K.
The assumptions used for this analysis are found at the end of this article ([i]). Figure 1: The nutrient replacement value of beef open lot manure is approximately $14/ton* when surface applied. *This assumes supplemental K is not needed and no yield increase results. Additional assumptions found at the end of this article. Manure is a supplemental source of P, organic-N, ammonium-N, and micro-nutrients commonly required by many fields. Cropland receiving surface applied manure (not incorporated) benefits from both the organic-N and P. The value of the nutrients in beef feedlot manure is heavily influenced by the value of the P and to a lesser extent the organic-N (see Figure 1 and assumptions for all figures presented.) Because feedlot manures and many solid manures contains little ammonium-N, incorporation to conserve N would produce little additional value. Similar graphics for other animal species are found in Figure 4. For many liquid and slurry manures, immediate incorporation of manure is important for gaining value from their significant ammonium-N content. Figure 2 illustrates the value of incorporating swine finishing barn manure. Approximately one-third of its value results from the ammonium-N conserved by direct injection. Note the importance of P to achieving value from both of these manures. Half or more of each manure’s value will only be realized by applying manure to fields requiring P supplementation (typically, fields with Bray soil P levels below 30 ppm). Thus, farmers wanting to gain the greatest value from manure should target those fields with low soil P levels. A 25 ton load of feedlot manure has a fertility value of $350. 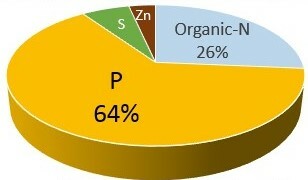 However, 2/3 of this value will not be realized if applied to a field with high soil P levels. Figure 2: The nutrient replacement value of swine finisher manure is approximately $37/1,000 gallons* when injected. *This assumes supplemental K is not needed and no yield increase results. Additional assumptions found at the end of this article. To further enhance the value of manure, targeting those fields that have a K requirement offers additional value. 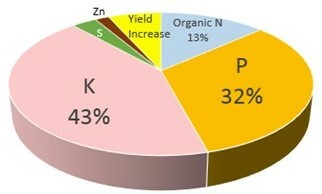 Soil tests for highly productive fields are increasingly identifying a need for K supplementation. 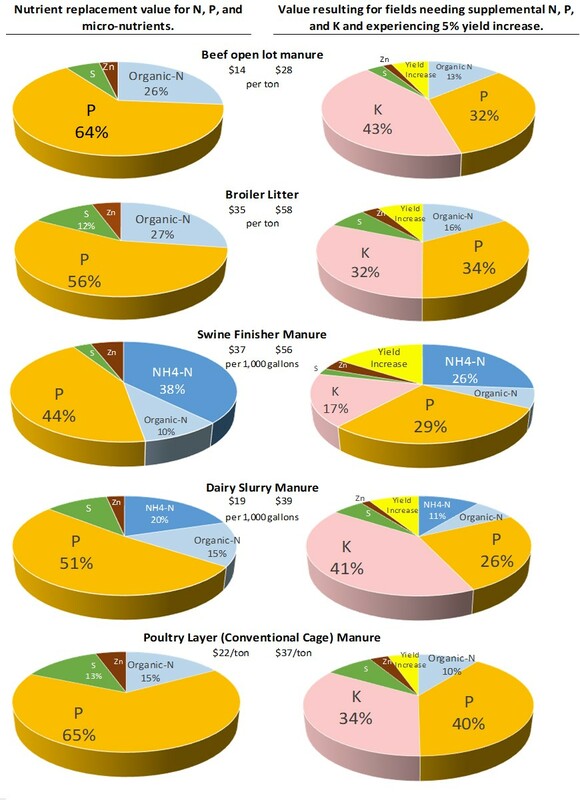 Manures are an excellent source of K. For the beef feedlot manure example shared in Figure 1, the manure’s value has almost doubled by applying it to a field with a K requirement (Figure 3). Economic value can also be gained from a yield response due to manure. Such yield responses can be a result of improved soil structure and greater drought tolerance of the soils receiving manure or from the increased biological activity in the soil producing a number of benefits such as greater nutrient availability to the plant. A recent worldwide literature review of 159 research comparisons of the nutrient replacement value of manure observed an average yield increase of 4.4%. Adding a 5% yield increase to a 200 bushel/acre corn crop will produce some additional value. However, note that this yield boost does not compare with the value of the P and K in manure (Figure 3). Figure 3: Value of beef open lot manure assuming crop benefits from potassium supplementation and 5% increase in yield. Estimated manure value is $28/ton. Manure should be applied at a rate that does not exceed the crop N requirements for a single year. Excess manure N application is likely to be leach beyond the root zone and be lost. See Determining Crop Available Nutrients from Manure for more information. Manure applied at rates near the crops N requirement typically over apply P and K. However, these nutrients will continue to be available to crops in future years. To gain the manure’s P and K value, target those fields requiring supplemental P and K (see Nutrient Requirements for Agronomic Crops in Nebraska or your state specific recommendations). In addition, avoid re-applying manure to the same field until soil testing suggests need for supplemental P and K.
Accessing the economic value of manure begins by targeting fields low in P and K. Similar benefits are observed for other manures as illustrated in Figure 4. Figure 4: Low and high economic value estimate of different animal manures based upon nutrient replacement value for manure N, P and micro-nutrients (column1) and additional value assuming benefit from manure K and crop yield increase of 5% (column 2).